Saint Maanikkavaasaka Swamihal also known as Saint Thiruvaathavoorar was one among the four great Saiva Saints of "Tamil Saivaism", of the pre-medieval and medieval period Tamil Nadu. However he has not been included among the 63 - Tamil Saiva Saints listed in the Tamil Saivite religious work "Periyapuraanam" also known as the "Thiruththondar Puraanam", composed by the sage/poet Seakkeelaar. 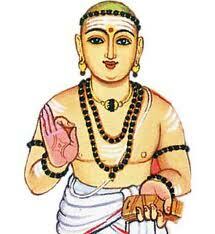 With him the total number of Tamil Saiva Saints of this period were 64 - in number. The reason for he not being included in the Periyapuraanam by sage/poet Seakkeelaar is yet to be known. It has been already determined that the approximate period of the Tamil Saiva Saint Thirunaavukkarsu Naayanaar of Tamil Nadu as A.D.568-649. From the fourth and the fifth Tamil "Thirumurai" of this Saint, we note of two references on the miracle of foxes being transformed into horses, that is said to have taken place during the time of Saint Maanikkavaasakar - by the grace of God Siva, which are as follows. Hence it is very clear from the above references of Saint Maanikkavaasakar himself - in his own work "Thiruvaasakam", that the above miracle mentioned by Saiva Saint Thirunaavukkarsu Naayanaar in his Thevarem (right above) is in fact correct, and occurred during the time of Saint Maanikkavaasaka Swamihal who lived before the year A.D.568 - the appoximate year of birth of Saint Thirunaavukkarsu Naayanaar. In the "Thiruvaasakam" of Saint Maanikkavaasakar, even though there are references to the Pandiya king of that period, there is no mention of his actual name in same. However in his other Tamil Saiva Religious work the "Thiruchitrambalakovaiyaar" (also known as "Thirukkovaiyaar)" there are two references to the Pandiyan king of his time namely the Varaguna Pandiyan - as follows. Note: The above reference goes to prove Varagunan (the Pandiyan king) referred in Thirukkovaiyaar by Saint Maanikkavaasakar, was different from the Varaguna Pandiyan - 2 of (A.D.862 -880) and the Varaguna Pandiyan - 1 of (A.D.800-830), as the Inscriptions and other historical and literary Documents on the latter two kings have not mentioned of they having carved the Pandiyan emblem the 'kayal fish' on the Himalayan mountain (vetpin - on the mountain). Hence it is evident that the (earliest) Varagunan being that of Thirukkovaiyaar who possibly went on an expedition towards the north of India, and carved the 'kayal fish' on the Himalayan mountain. Further though it is not specifically mentioned in Thirukkovaiyaar that the mountain under reference was Himalayas, no Tamil kings be it Chera, Chola or Pandiya would have ever considered it as a 'great pride' to say that they carved their royal emblems on a mountain within Tamil Nadu, instead of the great Himalayas as seen in many Tamil literary works of the Sangam & medieval periods. The fact the “Thirukkovaiyaar" too was composed by Saint Thiruvathavoorar is confirmed by Saint Nambiyaandaar Nambi as follows. Hence it is clear the Varaguna Pandiyan refered in the Thiruchitrambalakovaiyaar too like Saint Maanikkavaasaka Swamihal lived before the Saint Thirunaavukkarsu Naayanaar’s year of birth A.D.568. Further from the Tamil grammetical work titled "Kuvalayaanantham" we get two further valuable informations as follows in it’s ‘Sirrappu Paayiram’. “Kuvalayaanantham” – published by Dr.S.V.Subramanian, Ulaha Thamilaratchi Niruvanam, Chennai. Hence from the Saint Thirunaavukkarasar’s reference to the miracle in his Thevaram, and the references in the Kuvalayaanantham and Pandiya Kulothaya to this same miracle, we can safely conclude the Saint Thiruvaathavoorar (also known as Saint Maanikkavaasakar in Kuvalayaanantham and Vaathapuri Nayakar in Pandiya Kulothaya), and the Varaguna Pandiyan mentioned in latter two references, it is further confirmed that both lived before Saint Thirunaavukkarsu Naayanaar that is before A.D. 568. The instance when Saint Thiruvathavoorar received a further name as Maanikkavaasagar is clearly stated in the two Tamil works named the "Thiruvilaiyadal Puraanam" and "Thiruvaathavoorar Puraanam”, was at the occasion when he first started singing songs in praise of God Siva composed of “jewel (Maanikkam) like sentences (Vaasakam)". This name Maanikkavaasakar later was shortened and also used as "Vaasakan" or "Vaasakar" to refer him. We now find two other instances where Saint Maanikkavaasakar has been referred to by his short names, again in the Thevarems of the Saint Thirunaavukkarasar as follows. The above two references on Saint Maanikkavaasakar mentioned by Saint Thirunaavukkarasar, too takes the period of the former as earlier than A.D.568 the year of birth of the latter. The "Thiruvilaiyaadal Puraanam" of Paranjothi Munivar mentions that Saint Thiruvaathavoorar subsequently received the name Maanikkavaasakar, and the ruling king during his time was Arimarthana Pandiyan. But the same "Thiruvilaiyaadal Puraanam" relates to a separate event in respect of Varaguna Pandiyan - as a Pandiyan who fought and won a battle with Cholas. This from the history of the medieval Pandiyas we know was the Vargunan - 2 (A.D.862-880). The "Thiruvilaiyaadal Puraanam" doesnot associate him with Saint Maanikkavaasakar, or with the story of the miracle of foxes being transformed into horses. Hence the above gives us a hint that the Varaguna Pandiyan who won the Cholas is the latter Varaguna Pandiyan - 2 (A.D.862-880), and the Pandiyan king who was living during the period of Saint Maanikkavaasakar at the time of the miracle of foxes being transformed into horses was a Pandiya king different to the Varaguna Pandiya - 2, whom it mentions as Arimarthana Pandiyan. Hence from the references in "Pandiya Kulothaya", and "Kuvalayaanantham" both of which - mentions of the miracle and of the Varaguna Pandiyan, and the "Thiruvilaiyaadal Puraanam" which too mentions of this same miracle but refers to the the king as Arimarthana Pandiyan, we could conclude the Pandiyan of that period as Arimarthanan aana Varaguna Pandiyan (Arimarthanan alias Varaguna Pandiyan) who was no doubt an earlier Pandiyan with the same name Varagunan, and again reaffirm that he was quite different to the Varaguna Pandiyan - 1 (A.D.800-830) and Varaguna Pandiyan - 2 (A.D.862 -880). Also it should be noted that there are no evidences or inscriptions of Varaguna Pandiyan - 2 (A.D.862 -880) to confirm that the Saint Vathapuri Nayager blessed him to get back his lost kingdom as per the "Pandiya Kulothaya" and that too from his own brother. Hence the reference in "Pandiya Kulothaya" must be to the Aritmarthanan aana Varaguna Pandiyan of the earlier period. Further we have an interesting information in the Thiruvilaiyaadal Puraanam, that it was only after "eleven generations" of Pandiyan kings from Arimarthanan (aana Varaguna Paandiyan) came the Koon Pandiyan (also known as Pandiyan Nedumaran) of the Saint Thirugnanasampanthar period. If we take an average of 30 years for each king’s period of rule approximately, we note Arimarthana Pandiyan lived (30 x 11) three hundred and thirty years before Koon Pandiyan, that is around A.D.317 (647 -330). Hence it is clear the period of Saint Maanikkavaasakar earlier determined as before A.D.568 the birth year of Saint Thirunaavukkarasar, could now be pushed forward further to a period before A.D.317. Now referring to the religious work "Thiruvaasakam" of Saint Maanikkavaasagar, we note that there is hardly any reference to Jain religion in same, as compared to the Tamil "Thirumurai Thevarams" of other three great Saints, which refers to Jainism in many places as opposed to Saivaism. Hence we can be sure that Saint Maanikkavaasakar lived during the period when Jainism has not yet gained much deep roots in Tamil Nadu. In the year A.D.467 a king from a ruling dynasty of Karnataka by the name Kalabhras (Kalappirar), invaded Tamil Nadu and Kerala and defeated the Chola, Pandiya and Chera kings, and enforced their religion the Jainism that prevailed in a big way in Karnataka, into Tamil Nadu. The Kabhra invasion of Tamil Nadu is confirmed by the following references in the Tamil Saiva works titled "Kalladam" and Periyapuraanam. In the above Panchavan is the Pandiyan and "Karunaada venthan" is the Kalabra king, and "Aruhar" are the followers of Jain religion. kantha polil sool Mathuraapuri kaaval kondaan....."
This date of Kalabhra invasion have been approximately determined (with my own Research study) as in the year A.D.467, long after the date of the Arimarthana Pandiyan around A.D.317.". 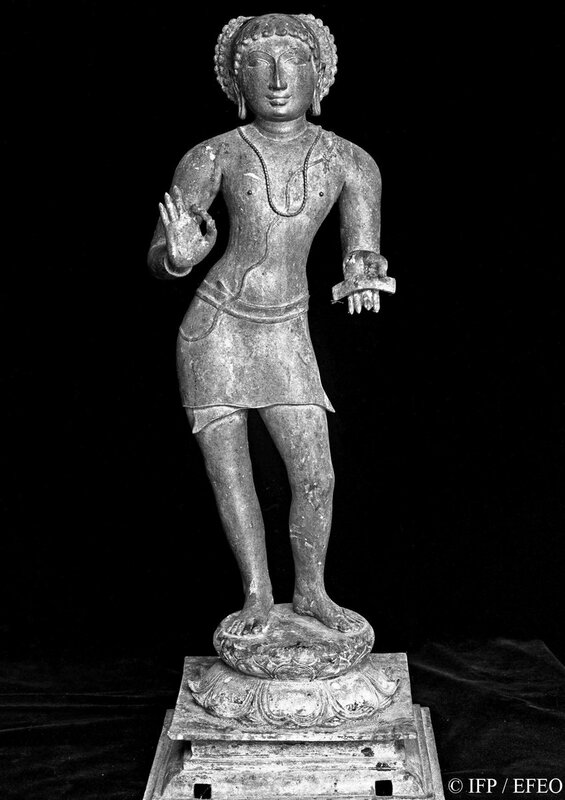 The Buddhism and Jainism had already spread to some extent in Tamil Nadu earlier during the 3rd Sangam Period, but it was only after the Kalabhra capture of Tamil Nadu the Jainsm became deeply rooted as a religion of this region with the patronage of this king. 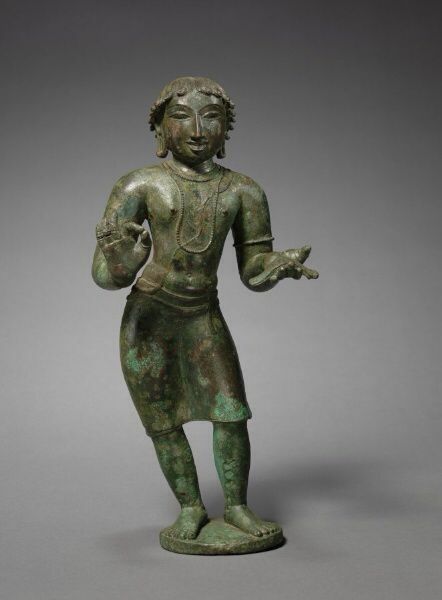 Further from the early days of Tamil Nadu the “Saivaism religion” having “Siva Agamas” as their principal religious texts - long prevailed, and in the "Thiruvilaiyaadal Puraanam" we are informed that Saint Maanikkavaasakar too was more interested in learning the "Siva Agamas " in his youth. This may be the reason why Saint Thirugnanasampanthar, Saint Thirunaavukkarasar and Saint Sundaramoorththy Naayanar have mentioned in many of their Thevaarems to the Vedas & Vedism in addition to Saivaism, while Saint Maanikkavaasakar speaks more on Agamas and Saivaism than the Vedas in his Thiruvaasakam. Vedism though was already in existance in Tamil Nadu from the Sangam period, it became deeply rooted in Tamil Nadu only during the period of Pallavas. Hence it is clear Saint Maanikkavaasakar lived before the invasion of Tamil Nadu by Kalabhras in A.D.467 being around A.D.317, long before Jainism & Vedism deeply rooted in Tamil Nadu during Kalabhra and Pallava periods. In the above verse in the 'Kuyit Paththu' composed by Saint Maanikkavaasakar, he is asking the Cuckoo (Kuyil) to 'coo' calling God Siva to (give vision to him), whom he describes as Mannan, Vallal, Thennavan(Pandiyan), Cheralan, Cholan and Puyangan. Since he lived in a period before Kalabhras and Pallavas he has made exemplary note to God Siva only - as the Thennavan, Cheralan, and Cholan. Now from a Copper Plate Grant that remained among the Christians of Kollam in Kerala State we note the following text..
“…..After the royal punishment implemented against 72 - families of Vellalar of Kaviripoompattinam who believed and joined the Christian faith, they boarded a ship and went to the the place Kurakkeni (Kollam) where the (other) Kurakkeni Christians too lived like relations in the year A.D.293. The Christians from Niranam too (north of Kollam) came to Kurakkeni and saw the Tamils there and followed few Tamil customs and Malayalam customs and lived there. (During this time) the one who performed miracles (and) by the name Maanikkavaasakar met the Christians who came newly to this region, by his miracles set the God he worshiped on them and caused fever, faintishness, and crippling of limbs, and killing the (domestic) animals and those who became sick thus when they humbly meet him and receive holy ash (thiruneeru) and on applying they get cured (of sickness )and rid off evil spirits. As it was a country of many Saaviya religion, those who respect him on the sly take them to Maanikkavaasakar, and listen to Panchaakra (mantra), and on the sly give donations to temple, and going and preying at temple festivals, and on the sly listening to the religious stories and Kaaviyaas and Mantras. During this time the 24 families who came from Cholamandaam and the others who came and met Maannikkavaasagar and the 72 families gave and got brides among their families and lived in unity. During that time the 72 families got together at the instance of the death of the leader who took up the leadership and executed all assignments, 8 families among the 72 families who got absorbed in the miracles of Maanikkavaasakar and 4 families who searched and met him and 20 families who were of this region in all 32 (families) 114 people met with one mind insisted such a respectable leader’s body to be covered with new cloth ans cremated. While the other 94 families in the Malayala 339 families, the Kurakkeni Christians too from the time embraced the Christianity to this day insisted that the the body of the dead be covered in white cloth and be buried in their (own) places, then the former (group) insisted they liked to hear the Guru Mantara of Panchakkara of their forefathers and intake the Panchakavya of the cow dung, urine, milk, curd, ghee, and if you do not listen to the words of Seedar (Sheeshayas)we 119 people will leave your religion. (Translation into English of the Tamil version of the Copper Plates from Thiruvananthapuram given in the book) - titled…. Maanikkavaasakar Peruman Varalaaru - by K. Subramaniyapillai. The above Copper Plate text mentions of : one Maanikkavaasakar who performed miracles and who recited Panchaakkara (Panchaatchara) Mantra and offered Holy Ash (thiruneeru) to the people. From same it is clear the Maanikkavasakar mentioned above was a Siva worshipper. Further it is said the people of this country he met were mainly of the “Saaviya” (Saiva) religion. Hence the people of this region kept him in high reference and even made a godly image and worshipped. From the foregoing we can safely conclude he could be no other than the Saiva Saint Maanikkavaasakar. It is indicated in the Tamil translation that “…..72 - families of Vellalar of Kaviripoompattinam who believed and joined the Christian faith, they boarded a ship and went to the the place Kurakkeni (Kollam) where the (other) Kurakkeni Christians too lived like relations in the year A.D.293……”. But on my reading of the original Tamil-Granthaha writing of the Copper Plates, I find a date has been omitted in the Tamil translation which when included reads as "….in A.D.315 one who performed miracles (and) by the name Maanikkavaasakar…..” possibly visited (Kurakkeni) Kollam from Pandiya Nadu. From a Thanippaadal given below we come to know the life period of Saint Maanikkavasakar was 32 years. Periyapuraanam - by Seakkeelaar, Thiruppananthaal Sri Kaasi Madam, Sri Vaikuntham, Tamil Nadu. We could reasonably expect him to have held the position of chief minister of the Pandiya king at an age of 24. He thereafter visited many Saiva sacred places, and possibly towards the latter period of his life time possibly around 30 years (A.D.315), he visted (Kurakkeni) Kollam in Kerala. Hence we can conclude that the Tamil Saiva Saint Maanikkavaasakar was born in A.D.285 (317-32) and demised in A.D.317 (315+2), before the period of Kalabra invasion around A.D.467 when Jainism has not deeply rooted in Tamil Nadu, and at a period when Buddhism held a strong position in Tamil Nadu, and during the period of the Arimarthanan alias Varuguna Pandiyan who has been establised as ruling around A.D.317, at a time when Saivaism with Siva Agamas as their principal texts prevailed along with other religions in Tamil Nadu, and at a period when the Christian faith too was gaining grounds in (Kurakkkeni) Kollam Kerala (Chera Nadu) - a period long before the Pallava rule in Tamil Nadu. Kavignar Vairamutthu and any average laymen of today, composing a poem each, could both be of the same linguistic scholarship. Could people many centuries later point to the poem composed by the average layman and say he doenot belong the period of Kavignar Vairamutthu being year 2008. Vairamuthu - film songs compared with his own published (printed ) poems - style, diction, linguistic purity, structure, presentation -- all differ tremendously between themselves.